42 LISTS The Walking DeadLists about AMC's hit show, adapted from a comic book series, about life for survivors of an actual zombie apocalypse. At first glance, The Walking Dead and Breaking Bad couldn't be more different. One is a zombie apocalypse/human survival epic, the other a modern classic about a common man forced by circumstance into a life of crime, becoming in the process perhaps the greatest anti-hero of our time. But consider, for a moment, that The Walking Dead and Breaking Bad share a universe and are subtly connected somehow. Sound totally implausible? Well, think again. 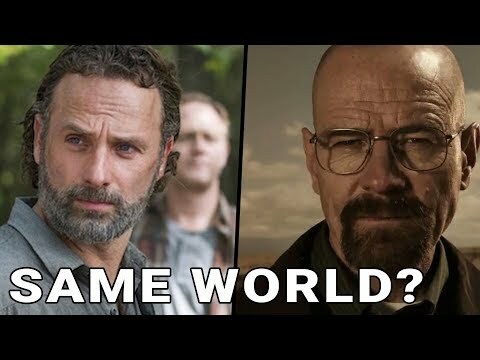 Crazy Walking Dead–Breaking Bad fan theory speculation abounded in 2017, and some of these ideas actually hold water (some, on the other hand, are a stretch, even to the most conspiracy theory-minded fans). Some firmly believe The Walking Dead is a Breaking Bad sequel; others note intriguing, but random, correlations (or Easter eggs) between the shows. Breaking Bad protagonist Walter White's claim to fame is the unique blue meth he cooks up thanks to his background in chemistry. The drug, which White manufactures in Albuquerque, New Mexico, somehow makes its way to Georgia. The second episode of the second season of Walking Dead, 'Bloodletting', features a stash of Blue Sky in one of the clearest signals The Walking Dead and Breaking Bad share a universe. None of the characters on Dead talk about or even acknowledge the Blue Sky. Does this mean the two shows inhabit the same universe? Does it indicate that Walter White's empire lives and thrives? Who knows. But that's definitely Walt's product. In the eleventh episode of Season 3 of Fear The Walking Dead ("La Serpiente"), Madison and Walker walk through a market on a hunt for water. In the background, you can hear a snippet of a song from Breaking Bad associated with Walter White's alter-ego, Heisenberg. I tried to be subtle with it. That was probably the moment when I fell the most deeply in love with Breaking Bad, when they did that cold open music video. As we were looking for pieces to incorporate into this world, it had the right vibe to it. It's a gentle nod of admiration and adoration to Vince Gilligan. On Breaking Bad, Walt buys Walt Jr. a red Dodge Challenger with black racing stripes. Walt's wife, Skylar, is far from pleased, forcing her husband to return the car. When he attempts to do so, he's told by the used car salesman, a young man named Glenn, there's a restocking fee to return the vehicle. Rather than pay the fee, Walt blows up the car. Fast-forward to the second episode of The Walking Dead, you see a red Dodge Challenger driven by a man named Glenn. This theory suggests Glenn from the car lot bought the car from Walt before detonation and drove it to Georgia. On The Walking Dead, Darryl mentions Merle's old drug dealer as a "janky little white guy." He goes on to quote the janky little white guy as saying, "I'm going to kill you, b*tch." There is perhaps no jankier little white guy than Jesse Pinkman of Breaking Bad. Not only is Pinkman a drug dealer, he also has a fondness for calling people "b*tch" and rattling off idle threats. This might also help explain why Merle has a stash of Blue Sky.